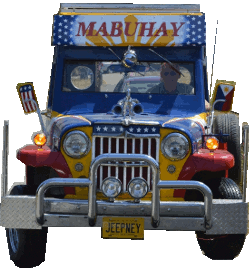 The Carabao is a jeepney made entirely here in the United States which is in the process of being converted from a Willys Wagon, much the way the orginal jeepneys came into being from old Willys jeeps. It will be completed in the summer of 2013 and begin making appearances at car shows, Filipino cultural events, and parades after that. Events will be throughout the Western United States. In order to finance these appearances, we are seeking marketing partnerships with Filipino oriented organizations and businesses. Bronze: $500 partnership level – All of the Rattan, PLUS 4” x 4” name on side of jeepney (yellow stripe or roof placement). Silver: $2000 partnership level – All of the Rattan, PLUS 16” x 8” name on both sides of jeepney. Gold: $7500 partnership – All of the Silver, PLUS name or logo on front, PLUS rotating rocker panel banner along bottom sides PLUS 9”x12” ad inside vehicle, PLUS distribution of your ads in pocket on vehicle. Platinum: $25000 partnership – All of the Diamond PLUS jeepney custom repainted in your colors and logo. Sponsors will receive updates on schedule and appearance reports on a frequent basis. Please contact me as soon as possible to secure your placement.